Album: "Joy To The World"
Review: Christmas comes but once a year -- unlike Halloween, where we don't necessarily have to wait for October 31st to start celebrating. Christmas is a time for tradition and family, stringing up twinkle lights, trimming the tree, spiking the eggnog, watching Clark Griswold take on Christmas, and listening to kids hoping it snows and shaking gifts lying underneath the Christmas tree. So, Santa, if you are out there, I am still waiting on that iPad or that copy of Red Sonja that while I won't buy it myself, I will be more than happy to take off your hands. We all have our guilty pleasures, right? Perhaps one of the guiltiest pleasures I have is music. The amount of music I have on CD is ungodly. However, I have only a few Christmas music CDs. I have neglected this category of music. Perhaps one of the reasons for this omission is that Christmas music isn't something most of us listen to except when Christmas jingle, jangles into town. On the upside, we have time to detach and recover ourselves and go back to the humdrum of everyday life. Wouldn't you agree that Christmas is the most labor intensive and manic holiday of the year? Yet, no matter how busy I may get, every year I take time and pull out the same treasured CDs to play the favorites that everyone knows well, like Willie Nelson's "Pretty Paper" or Bing Crosby's "White Christmas." Seriously, this year I was determined to buy a new Christmas CD and put it into rotation. The lucky CD that won me over was Pink Martini's "Joy to the World." Pink Martini is a 12-person act hailing from Oregon and lead by pianist Thomas Lauderdale, who describes himself and fellow Martini brethren as "... a rollicking around-the-world musical adventure... if the United Nations had a house band in 1962, hopefully we'd be that band." Pink Martini's "Joy to the World" is a collaborative effort between Pink Martini and other musicians. It is a collection of trans-cultural selections that celebrate this festive time of the year through many voices and languages, including Japanese and Arabic. 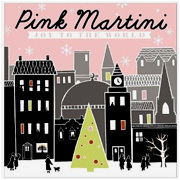 "Joy to the World" is Pink Martini's fifth and first holiday album. Pink Martini's music is melodic, retro, kitschy, and filled with diverse interests and a multi-cultural background, which represents the diversity of America's racial, ethnic, and cultural landscape. However, "Joy to the World" is larger than Pink Martini because the contributions to this album are not exclusively by Pink Martini. Pink Martini has tapped some very talented people to appear and contribute to this album, such as a Japanese rendition of "White Christmas" sung by Saori Yuki, a famous Japanese songstress described as the "Barbara Streisand of Japan (BBC)." One of my favorite tracks on the CD is the Ukrainian schedrivka or New Year's carol called "Shchedryk," which means "bountiful" and tells the story of a swallow flying into a household to sing of wealth that will come with the following spring. The swell of layering voices and the intricate unison of bells usher the listener upward; it leaves you with raised spirits. An album like this is ambitious, and it could have easily come off as elitist and pretentious were it not in the mindful and studious hands of the Pink Martini. Lastly, while this isn't a Brian Setzer album, I think it is an evenhanded, satisfying musical effort by Pink Martini and their motley assembly of fellow musicians. Pink Martini's "Joy to the World" is one of the best eclectic Christmas albums available today. It is a worthy addition to an audiophile's collection as well as one that would be welcomed by family members of all ages. For electronic music I recommend you check out Peppermint Wreath. It's pretty good. Nicely written review as well. Excellent review! Very well written. Though there was a whole lot of "Joy to the World". Peppermint Wreath, eh? I shall check it out. And thanks! Slowly learning the ways of writing something other than a university paper. :D hehe Thanks for the encouragement. I think it's a pretty good CD for a holiday album! Going to check this out when I get home. I'm not overly fond of christmas tunes but I always like to hear something different. Lemme know what you think 10,000. I can't say it will be for everyone, but during Christmas there are just songs (because of the artist I think more than anything) that just start to grate on your nerves. Most of the time, this can be alleviated by the fact they aren't played year round. I just found this album to be eclectic and not pretentious or overdone. I am big into different cultures so it was a treat for me.